The Barossa Valley is renowned for Shiraz, with robust wines featuring plenty of fruit intensity and concentration, and endowed with firm, ripe tannins and the ability to age. Located 50 miles northeast of the South Australia capital Adelaide, there are two main vineyard areas in the Barossa. The Barossa Valley floor stretches from Nuriootpa in the north, to Lyndoch in the south. The majority of vineyards have sand-based soils and span from the eastern banks of the North Para River. As the valley floor begins to slope upward it becomes the Barossa Ranges, with predominantly red clay/loam soils and the higher altitude bringing comparatively cooler, windier, wetter conditions. On hitting 400m (1,300 feet) elevation to the east (the ridge of the range), the region is then classified as Eden Valley, where it is also marked by a distinct change in soil type. Summers are warm to hot with little rain or subterranean water for irrigation and many old, dry-grown vineyards. 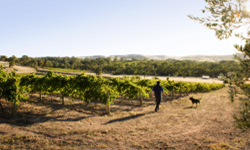 The higher altitude Eden Valley and Barossa Ranges provide cooler conditions, reflected in the wine styles.